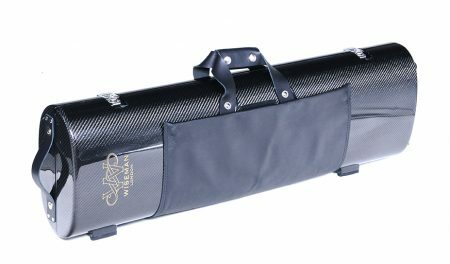 Carbon-Fibre oval-sectioned case to provide the greatest protection for valuable violins. 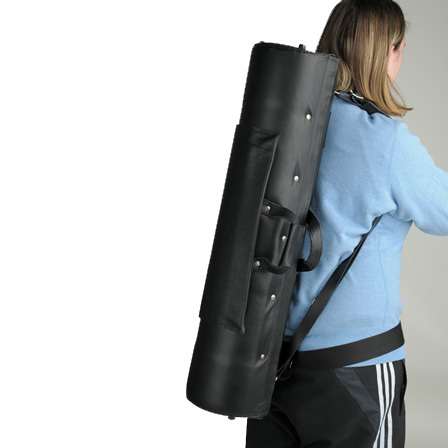 Featuring stainless steel hinges and locks/catches, The violin is suspended on rubber blocking with the belly and scrollhanging in to space. 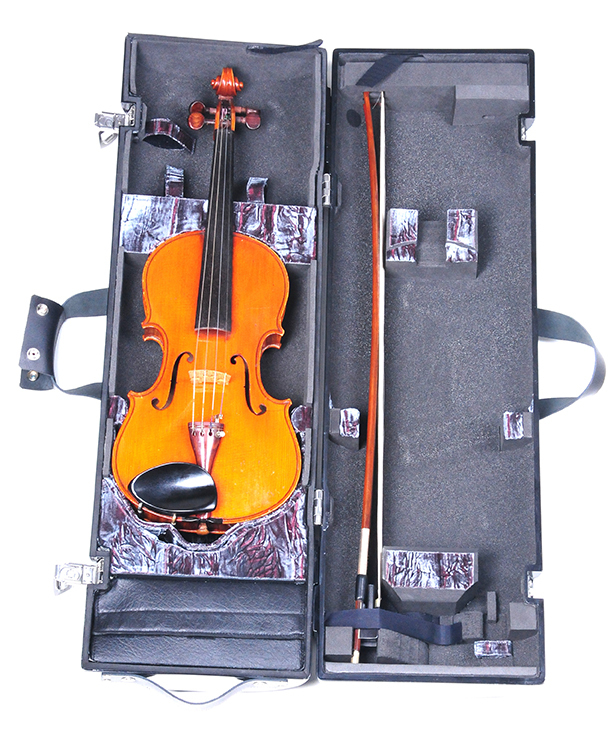 Hidden structural reinforcements to add enormous crush-resistance to the design – e.g wooden pillar posts joining the base and lid of the case on either side of where the neck joins the violin. Up to four bows are suspended between shock-absorbing rubber blocks, with no possibility of hairs catching, or the bows themselves becoming loose to hit against the violin. 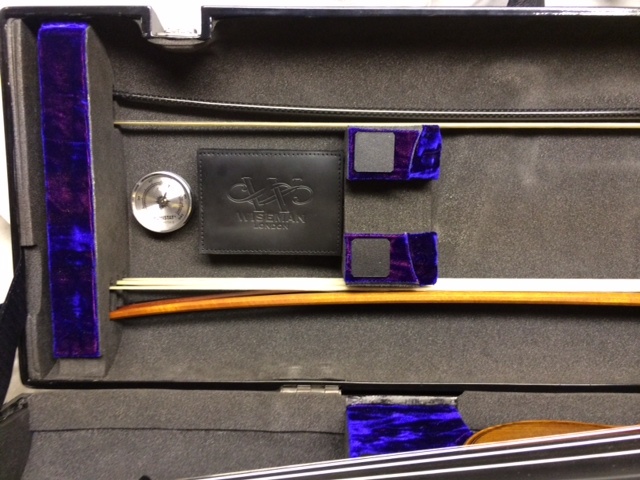 A removable extension block can be produced to enable the safe storage of a shorter baroque bow. Very large storage area around the scroll end of the violin with straps to hold a shoulder rest, and a large specific storage pocket area is at the other end for general accessories. Whilst there will be a standard Wiseman design, any of the customer’s own requests/needs will be discussed and built into the design if possible. We are also making these cases with all the same design features for Violas. These cases are slighly wider than the Violin. Please do email us for more information. 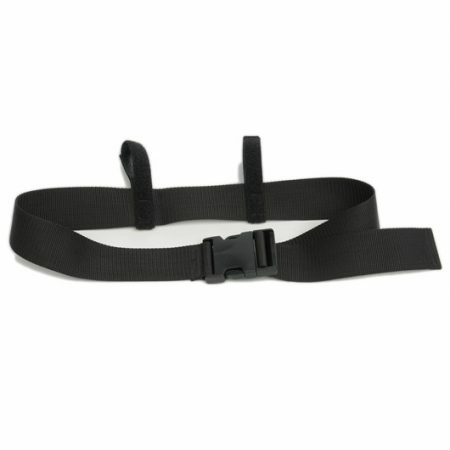 Supplied with two thick leather straps and padded non-slip leather shoulder pads. The shoulder pads are fixed into the buckle of the leather shoulder straps to stop the pads from sliding. Detachable A3 sized leather music pocket poppers onto the outside of the case. Delivery time: We are currently working from a waiting list. If we have this in stock, then we will send within two weeks of recieveing payment. If you have ordered a different-coloured leather (other than black) then this is a custom order and we will let you know the delivery time once the order has been processed. If you would like to know when you could recieve a case, or if it is in stock, then please do email us: sales@wisemancases.com and we can provide you with the current waiting time.